In moving from the “practical realism” of Gannah to the “intensely magical” Gemworld, we move from a blatant depiction of Christians with a strong impact on an entire society to a world where God is more undercover—as He is often seen in our own world. Yet, the culture given to us by Jeremy has the same “ring of truth” I find in Gannah. Not surprisingly, Jeremy’s response to the basic question posed by this series is in line with God’s reality in his writing. What has the Lord called you to do with your writing? Now, some people can give you an answer right off the cuff. I’ve never been that guy. I’ve never had that much insight into my own life, let alone the life of the world I’ve created. As relating to God, the only thing I can say with certainty is, “I am whatever the Lord wants me to be at any particular moment.” It’s the same answer for writing as it is for living. The cool thing is that, while you may not have that level of insight into what God wants out of your writing, you do know that He wants SOMETHING, so you’re able to provide whatever raw materials you have at your disposal with the trust that whatever God plans to build, He plans to involve you in the building. I’ve never really considered myself a Christian writer, just as I don’t consider myself a Christian security officer or, when I worked at an auto shop, a Christian mechanic. My relationship with Christ colors everything I do, from fixing cars to guarding nuclear plants to writing novels, but I’m not “fixing” Christ, nor am I “guarding” Christ — though, like I said, Christ colors my work, and thus opens opportunities for me to share Him with others. Likewise, when I write, I don’t write with the intentions of “writing” Christ. Instead, I allow ME (the “Christ colored” me) to flow from me, manifesting “me” in whatever I do. Nonbelievers might be resistant to connecting with a Christ that they cannot see, but if I can get them to connect with me, I might be able to connect them with Him who sent me. But that’s really what you do as a writer. You take a collection of what-ifs — of your own making, or as provided by the world at large — and connect the dots in unexpected ways, revealing to the world something miraculous that might otherwise seem mundane. Thing is, when I first started writing (inspired as I was by the Deathgate Cycle by Margaret Weis and Tracy Hickman) I never dreamed that my writing would be anything other than internet doodles and disjointed stories. When I finally published, I did so more at the insistence of my online friends — a community of believer who, like me, were writers who just happened to be Christian — than anything else. I hardly expected to sell more than a few copies. I hardly expected ANY return on investment, other than being able to leave my kids a legacy of imagination, and a little proof that their Daddy (who is sure to become an idiot in their eyes, as soon as they hit their teen years) is actually a pretty smart cookie. 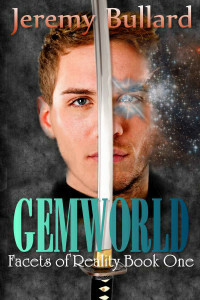 I didn’t have any real expectations out of Gemworld, and don’t hold many more expectations for its sequel, Fracture. All I expected was to provide God the raw materials — the raw ME — for Him to use in whatever manner He saw fit. I still don’t know exactly what God has called me to do with my writing, other than to just be me (the “Christ colored” me) and let Him do the rest. But I do know what He HAS done so far, and I stand amazed and eager to see what comes next! It is great to see what makes a writer tick and where their relationship with God fits in with and is the basis of their writing. Reading accounts like this can really help a reader decide to read your books. This account shows you have integrity and a sincerity to write based on what God wants through you. This is what I love about you and David Bergsland.